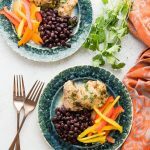 From BoulderLocavore.com: I love this chicken recipe! It has a wonderful melding of sweet and savory flavors and it is so easy to prepare. Jalapeno peppers can vary incredibly in heat. For my preparation I did not find the recipe overly spicy (it had beautiful flavors). If you are a spicy-lover and don't find it spicy enough, you can always add hot sauce at the end. The recipe is fast to prepare and marinates overnight. Actually cooking time is only 10 minutes. I've added extra time to the Total Time to account for the marinating, the Instant Pot coming to pressure and the 10 minute slow release dictated by the recipe. In a large bowl, combine all ingredients except for chicken and chicken broth. Pat chicken thighs dry with a paper towel. Toss chicken into marinade. Cover and refrigerate overnight. Place trivet in Instant Pot®. Place steamer basket on trivet. Pour in chicken broth. Arrange thighs on steamer basket and pour extra marinade over the thighs. Lock lid. release naturally for 10 minutes. Quick release any additional pressure until float valve drops and then unlock lid. Check the chicken using a meat thermometer to ensure the internal temperature is at least 165°F. Excerpted from The I Love My Instant Pot© Recipe Book: From Trail Mix Oatmeal to Mongolian Beef BBQ, 175 Easy and Delicious Recipes by Michelle Fagone (CavegirlCuisine.com). Used by permission of the publisher, Adams Media, a division of Simon & Schuster. All rights reserved.